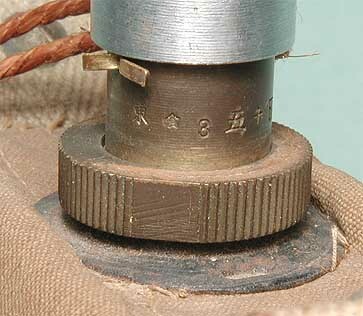 Type 99 Magnetic Anti-Tank Grenade - a.k.a. 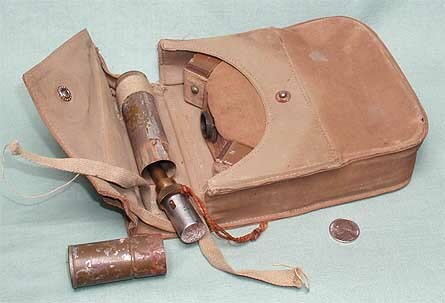 "Turtle Mine"
Although commonly referred to as a "mine", it has a delay action fuze that is manually set. As with the German magnetic and sticky grenades, these are manually operated and deployed. The term mine is not technically appropriate. This is referred to as the "Armor Piercing Grenade Model 99 Hako-Baku-Rai", by the Navy publication "Hand, Rifle and Mortar Grenades", May 15, 1944. 4.74 inches in diameter by 1.5 inches thick, it contained 1.5 pounds of 50-50 RDX-TNT in eight cast pie shaped blocks inside a cloth body. A snap flat at the bottom allows access to the inside. (This specimen has wood blocks substituted for the explosive.) The fuze delay was 8–10 seconds. There are four equally spaced permanent magnets attached by khaki webbing. Two grenades could be stacked for more effect. The "N-S" markings on the magnets are probably to aid in mating the grenades. Coupled together, this would penetrate about 30mm (1.25 inches) of steel plate. There is a small cloth tag on the left side on the side of the grenade with Kanji. The ones on this grenade are faint, and difficult to see, but I believe I can read something to the effect of: Ha-Baku-Rai-Sha, "Demolition Explosive Mine Tank". Nothing like fuzzy writing, in a difficult language, in a Military style for a challenge!! The fuze is very well made. 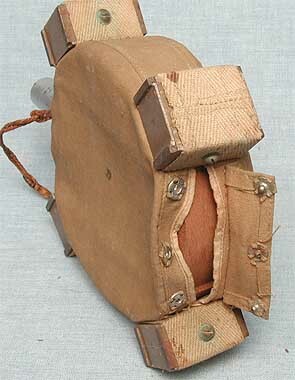 At first glance it looks similar to the Type 99 hand grenade fuze, but functions very differently. It contains two springs: a large compression spring and a firing pin spring. The latter is contained in the firing pin sleeve. Four steel retaining balls fit into holes in the fuze body. These balls are pressed into notches in the firing pin holding it in a cocked position. The fuze cap hold the balls in place, and is kept from flying off by the small set screw which fits into the oval cut. The powder delay train threads into the base of the fuze body and the detonator tube threads over the base of the delay train container. 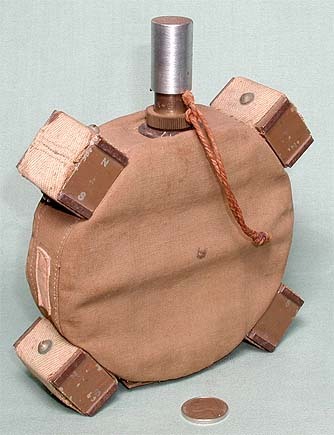 The fuze is carried separately and is secured to the mine by a locking ring. The safety pin is pulled and the fuze cap is given a sharp rap. The cap is forced downward against the compression spring. The inside top of the cap is a larger diameter which allows the retaining balls to be forced out of the way of the spring-loaded firing pin, which shoots forward into the percussion cap. The mine is then placed against an armored surface. My thanks to Rex Gallogly whose fine article "Japanese Model 99 Armour Penetrating Grenade" in Military Trader magazine, provided a most useful reference.